You can now take selfies in space, as well as explore space with NASA’s new apps, with one of the apps being available on both Android and iOS devices. The space agency released two free apps on Wednesday as a way to celebrate the 15th anniversary of the Spitzer Space Telescope’s launch. On Wednesday, NASA announced that it has launched two new apps via the Jet Propulsion Laboratory at the California Institute of Technology, in order to celebrate the 15th anniversary of the Spitzer Space Telescope, which greatly contributed to the exploration of different planetary worlds. 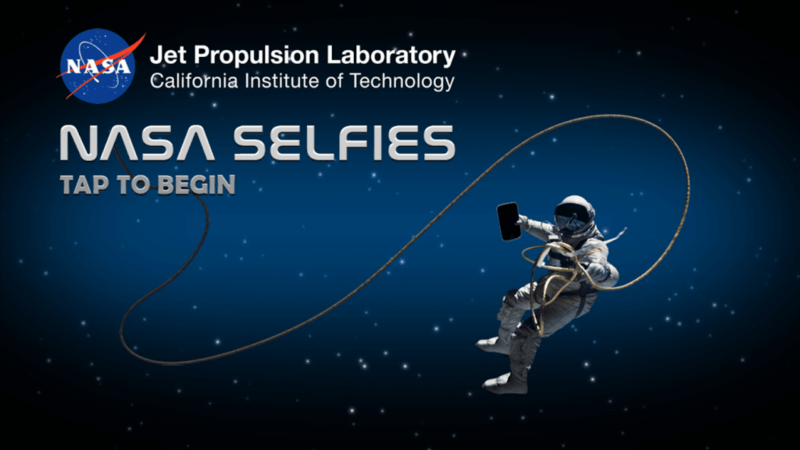 The NASA Selfies app lets you take selfies in space. It’s quite easy to use – after downloading it from the Google Play Store or App store, launch it and you’ll be offered to take a selfie in an astronaut suit from various mesmerizing cosmic locations – the Andromeda Galaxy, the Orion Nebula, the center of the Milky Way galaxy or elsewhere. The app has a simplistic interface that quickly lets you get used to how it’s used. You can take a selfie, pick the background and share it on social media for your friends and family to see. Additionally, we noticed that the app has an educational characteristic to it, since in the lower corner of each image there is a little information about that particular location. At the moment, there are 30 eye-catching locations to choose from, and all those pictures were taken by the Spitzer Space telescope. As NASA wrote in the press release, more beautiful cosmic locations are to be added in the future. The second of NASA’s new apps is the Exoplanet Excursions VR app. That said, users who are fond of a VR experience can embark on a journey of the TRAPPIST-1 planetary system. TRAPPIST-1 is vastly important for our understanding of exoplanets. It is the only system that is known to support seven planets of roughly Earth’s size. The Spitzer Space Telescope vastly contributed to the detection of those planets, as well as their probable compositions. Since the TRAPPIST-1 star system is quite far away, scientists can’t directly observe the planets, although the new VR experience app shows what different artists impression of the planets to be. All the artwork is based on data delivered from the Spitzer Space Telescope, as well as other telescopes that observed this highly interesting star system. The app will be available for Ocolus and Vive through the Spitzer mission website and is soon to appear in the Ocolus store. There will also be a 360-degree video available on the Spitzer YouTube page, which can allow users to explore the star system on their desktop, smartphone or with a smartphone 360-viewer. The Spitzer Space Telescope was launched into the solar orbit on August 25, 2003, with NASA estimating that it would be operational for approximately 2.5 years. However, the Spitzer Telescope exceeded all expectations and has remained operational for 15 years, and is estimated to work at least until November 2019. Thanks to the Spitzer Telescope, scientists discovered the largest known ring around Saturn, and also managed to form one of the largest maps of the Milky Way galaxy. In the last few years, scientists used Spitzer to learn more about exoplanets, planets that orbit stars other than our sun, even though the telescope’s designers didn’t have that in mind when it was originally designed. It has given us information far and beyond what was expected. Spitzer was used to study planets with hot surfaces, as well as those that are frozen solid and many others. NASA’s new apps are a great way to celebrate the 15th anniversary of Spitzer, so hurry up to the Play Store or App Store and take selfies in space of your own!